Hey Guys, Bea here! And a Happy New Year to you all! Prior to January 1st 2015, I was really struggling as an artist, just trying to find the right inspiration to get off the ground. Most of my time was spent working my day jobs, greatly dividing my attention. So, my art suffered, simply because I couldn’t find the time to invest in my ideas and the betterment of my skills. That said, I have arts to share! Despite all the hardships 2015 brought, it did not come without its rewards, and turned out to be a year of many firsts for me! I went from producing maybe 3-5 pieces of art per year, to the over 50+ Illustrations and Sketches that make up my portfolio, as of today. From those pieces, I created my first portfolio book, which also turns out to be my first full portfolio of new and original work since I left college over 5 years ago. I flew out to San Diego and experienced SDCC for the first time, and had the opportunity to sit down with major companies, like Blizzard, and Nickelodeon, among others, and received my first set of portfolio reviews, outside of school. And, as of Nov 22nd, I decided to stop working my day job, and be a full-time artist– which is the news I’ve been waiting for the right time to share. So, November 23, 2015 was the day I began working as a full-time artist. Ironically, this did not happen by me quitting. Instead, the company I was working for simply decided to close the division I was working in, and though they offered me a position working elsewhere, I figured instead that I would take this opportunity to give my dreams a try instead. I had considered leaving on my own many a times, but this was a company that I had been with for almost 8 years. I knew the work, I did it well, I had been promoted, and I didn’t want to leave, for fear that if I did, I’d have to start back at square one… so I stayed. But when they told me they were closing out, It was like a door had opened just as that one was closing, urging me to…take the next step. To go for it, even harder. Since then, I’ve had a lot of time to think about how I’m going to spend the extra time I have– and how this is all going to work out. To be honest, it’s a bit scary to think about. But like many of my friends, and people who I’ve met who reached the same fork in the road and made the same choice, I’m confident that if I play my cards right, and put in the work, I’ll experience success like they have. This brings me to the main topic of this post– My blog and my plans for 2016. After giving it much thought, I’ve decided to just scrap the Monday Evening Posts entirely, and for good reason. As much as I like the idea of having a regiment, I’ve found that in trying to stick with it, I’m more concerned with showing work for the sake of keeping time, than taking time to put more quality into my work, and the posts themselves. Instead, I think it’s best I post casually, when I have something to share, especially since it allows me to put more soul into my work, and my writing. If I may, I’d like you take a moment to talk about the art shared in this post. I started this illustration back when I decided to let my job go, in November, and it began with me drawing myself in a wedding dress, holding my sketchbook, and art supplies as part of my bouquet. When my friends asked what it meant, I simply told them, I love art, that I’m married to it, and committed to my dream of being a “successful” full-time artist, so that someday, I will be able to tackle the ideas, stories and concepts that I’ve been stockpiling for years, to share them and be recognized in the big world of art. The mark for this year? I want to focus on creating art that is driven more by narrative. Most of 2015, my work consisted of character designs. Instead, I want to strengthen my ability to tell a story, and Illustrate. In addition, to keep my focus where it needs to be, I will be less concerned about how polished these illustrations are– and more about how well I communicate my ideas, so you can expect that most of my personal works will be either sketches, rough concepts or speed paintings. I’ll also be experimenting with various different mediums, like watercolor, pen and Ink. So that’s what the art shared today is all about. Experimenting with different art mediums, my sketchbook spilling it’s pages of rough concepts, my ideas finding new life, and my dreams my goals– which embody and all the things I hope to share with you this year! As always, till next time, Enjoy! The girl who touched the stars finally has a name! It’s been such a long time since I’ve made mention of her, so in case it was forgotten, Estelle is the girl in my first banner illustration for this blog, which was a painting I did to test how much I’d learned after completing my 30 day sketch challenge back in January. This simple illustration sparked a lot of discussion between not only my friends and family, but also with some of the people who’ve been watching me through this whole process. I made friends, I gained motivation, I’m still going strong, and Estelle is a reminder of that. but because of SDCC, and portfolio prep, she was one of many personal projects of mine that hit the back burner. that is until I stumbled upon a different sketch I did of her– the one at the beginning of this post. Now I know it sounds weird– me stumbling across art I did, as if I forgot I ever drew them, but I juggle so much with my day job, and commission work, that many of the illustrations or sketches I start for myself, get lost in the mayhem. Now as promised in my last post of Estelle, I’d tell you a bit more about her. Her name means Star, and she is technically the embodiment of many interests I have, and an homage to things that inspire and influence me, as an artist. For example, Japanese animation is very near and dear to my heart. I love anime, especially the ones I grew up on, so I decided to draw Estelle in such a way that she resembles anime and a Japanese woman. Much like me when I was younger, Estelle has a very bubbly personality and an overactive imagination, aka she can literally get lost in the wonder of her dreams. Because of this, Estelle sees the world differently than most and imagines that her dreams and goals in life are stars, bound up in a sea of constellations waiting to be reached, and what she sees is so real to her, she could touch them. 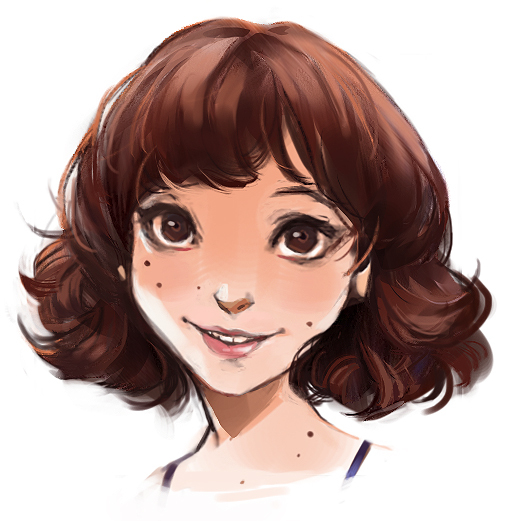 In terms of looks, she has a bouncy/playful hairstyle, big brown doe-like eyes, a quirky smile, and has 7 beauty marks/freckles– forming a mini constellation across her face, neck, and chest. Estelle wont be attached to any particular narrative, but I will draw her from time to time, to mark my growth, so each time you see her, she may look a bit different as my style improves!